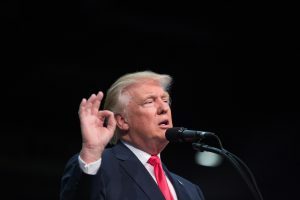 DES MOINES, Iowa — Donald Trump has made a rare admission he was wrong — in claiming he saw a video of a U.S. cash payment going to Iran. On the campaign trail this week, the Republican nominee has been dramatically describing a video that he says shows the U.S. paying off Iran as part of a deal to release U.S. sailors from Iranian custody. But there’s no evidence such a tape exists. The U.S. indeed paid that money to Tehran in January, in a publicly announced settlement of a decades-old international arbitration case dating back to when Iranians paid Washington for military equipment they never received. The U.S. government denies the payment was ransom for the release of Americans, which may or may not be true. The admission marked a stark and unusual reversal for Trump, who rarely admits to error. But it may end the brewing controversy around his false claim — one that recalls his unsupported contention early in the campaign that he saw video of Muslims in New Jersey celebrating the 9/11 attacks — instead of prolonging a potentially negative news story for the candidate. To the frustration of Trump’s aides and fellow Republicans, the celebrity businessman has all too often proven unable to let go of a bad story, often instead fueling it — like he did this past week when he escalated a flap with the parents of a slain U.S. soldier who was Muslim — at the expense of the campaign’s message. Trump first discussed the video on Wednesday. “I’ll never forget the scene this morning. And remember this: Iran – I don’t think you’ve heard this anywhere but here – Iran provided all of that footage, the tape of taking that money off that airplane,” Trump told supporters at a rally in Daytona Beach, Florida. A Trump spokeswoman told the Washington Post, the video Trump saw was grainy nighttime footage of people getting off a small plane, holding bags. “Geneva, January 17,” the footage is clearly labeled. Trump apparently assumed that this footage depicted the cash transfer — and concocted the story on his own about how the footage was acquired and the motivations for its release. Perhaps even more unbelievably, Trump then repeated his original claim Thursday at a rally in Portland, Maine — even after his campaign said that Trump had been mistaken.